Land and forest (or wildland) fire is a constantly occurring, globally-widespread phenomenon. Wildland fires currently burn 330-431 M ha of vegetation around the world, every year (Giglio et al., 2010). Many global regions have reported increasing fire activity in recent decades, which is attributed to numerous factors such as climate change-altered fire regimes, rural-urban population shifts, and land use change affecting vegetation and fuel conditions. Approximately 86% of global fire occurs in grasslands and savannas, primarily in Africa and Australia, but also in South Asia and South America; about 11% (35-47 M ha) occurs in the worlds forests (Mouillot and Field, 2005). The large majority of wildland fire is human-caused. With the vast amount of fire that occurs globally, a proportion inevitably becomes uncontrolled wildfire of which a small percentage has disastrous social, economic and/or environmental impacts. Most global fire is unmonitored and undocumented so the record of wildland fire disasters is incomplete. However, the existing record indicates that disaster fires occur in every global region, in every vegetated biome, on a regular basis. Disaster conditions are defined as any wildfire(s) situation that overwhelms fire suppression capacity to the point that human life, property, and livelihood cannot be protected. Besides the threat to human safety, these fires can also have serious negative impacts on human health, regional economies, global climate change, and ecosystems in non-fire-prone biomes. To mitigate fire-related problems and escalating fire suppression costs, forest and land management agencies, as well as land owners and communities, require early warning of extreme fire danger conditions that lead to uncontrolled wildfires. Early warning of these conditions allows fire managers to implement fire prevention, detection, and pre-suppression action plans before fire problems begin. Fire danger rating is commonly used to provide early warning of the potential for serious wildfires based on daily weather data. Fire danger information is often enhanced with satellite data, such as hot spots for early fire detection, and with spectral data on land cover and fuel conditions. Normally, fire danger rating systems provide a 4- to 6-hour early warning of the highest fire danger for any particular day that the weather data is supplied. However, by using forecasted conditions from advanced numerical weather models, extended early warning (i.e., 1-2 weeks) can be provided. This extra time allows for greater coordination of resource-sharing and mobilization within and between countries. The global wildland fire community recognizes that no individual country is capable of solving the problem of increasing fire activity and disaster fire occurrence on its own, and that greater international cooperation is required. The global fire early warning system is one component of A Strategy to Enhance International Cooperation in Fire Management (FAO 2006). Fire danger rating is a mature science and has long been used as a tool to indicate the potential for serious wildfires. Fire danger rating is the systematic assessment of fire risk and potential impact, and it is the cornerstone of contemporary fire management programs. It is used for many operational reasons: to determine suppression resource levels (fire fighters, equipment, helicopters, fixed wing airtankers), mobilization, and strategic prepositioning; to define safe and acceptable prescribed burn prescription criteria; to establish fire management budgets based on long-term fire danger statistics; and to justify increased funding during times of wildfire disaster. 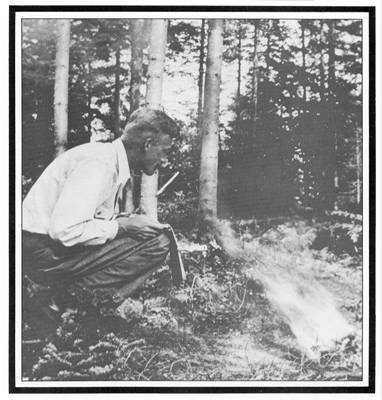 Fire danger rating research has been ongoing since the 1920’s, resulting in operational fire danger rating systems being available for about 4 decades in Canada (Stocks et al., 1989), the United States (Deeming et al., 1977), and Australia (Luke and McArthur, 1978). Numerous other weather-based systems and indices have been developed worldwide, although the Canadian Forest Fire Weather Index (FWI) System remains the most widely used fire danger rating system internationally. While there are many countries that have implemented fire danger rating systems, there are equally many countries that have no system in place. Where national systems are in place, there is also a wide range in their design and operational use. In recent decades, as the severity of fire seasons increased in different regions of the world (FAO 2007), the global wildland fire community recognized the importance of greater international cooperation and sharing of information, skills, and resources (FAO 2006, IWFC 2007). As a result, it became increasingly apparent that a common system was needed to provide global fire danger information and early warning of disaster conditions. The concept of a Global Fire Early Warning System for Wildland Fire (EWS-Fire) has a fairly recent history, and is supported under the United Nations International Strategy for Disaster Reduction. It is a Project of the Global Observation of Forest Cover and Global Observation of Landcover Dynamics (GOFC-GOLD) Fire Implementation Team, which is comprised of numerous international wildland fire, remote sensing, and weather agency representatives. The primary purpose of the Global EWS-Fire Project is to develop a globally consistent suite of fire danger and early warning products to support international collaboration and reduce wildfire disaster. As part of this process, fire danger and early warning information is made widely available to all countries through open access. As well, the Global EWS-Fire Project actively supports projects to assist countries with limited fire management capacity in the local use and application of fire danger and early warning information. The Global EWS-Fire was officially launched and publicly available in May 2011 and system development is ongoing as new products are being designed. The purpose of the Global EWS-Fire is to link the wide range of uniquely calibrated, national fire danger rating systems currently in operation, with a single set of fire danger indices that have globally-consistent calibration. These global indices allow weather-based comparisons of fire danger across national borders and continents over a spectrum of time scales. They are provided as a supplement to national systems and serve to support large-scale bilateral fire management decisions such as suppression resource-sharing and resource mobilization in advance of disaster conditions, similar to the centralized decision-making of national fire management agencies with nationally calibrated systems. For the many countries in the world that do not have the internal capacity to develop a national fire danger rating system, the Global EWS-Fire provides an operational fire danger rating system that can be calibrated to regional conditions. Long-term early warning products (or seasonal forecasts) provide an indication of anticipated global trends in fire danger over the course of the upcoming fire season. Short-term early warning products (1-2 weeks) provide information for large-scale tactical decision-making that requires ‘spool-up’ time to implement fire management action plans such as arranging the transfer of helicopters, fixed-wing air tankers, or fire fighters and equipment across international borders. Early warning of 1-7 days provides information for strategic decision-making, such as pre-positioning suppression resources in the most critical areas to most effectively control new fires and contain on-going fires. Figure 1. Structure of the Canadian Forest Fire Weather Index (FWI) System. The FWI System (Van Wagner 1987) was used for the Global EWS-Fire since it is the most widely used system, internationally. As a brief summary, there are six components in the FWI System that reflect fuel moisture and general fire behaviour at a landscape scale, as influenced by weather (Wotton 2009, Fig. 1). There are three fuel moisture codes representing the moisture content of dead fine fuels (Fine Fuel Moisture Code, FFMC), surface organic matter of moderate density, such as the F layer of forest soils (Duff Moisture Code, DMC), and deep, compact soil organic layers, such as the H layer of forest soils (Drought Code, DC). The fuel moisture codes are also used to represent the moisture content of dead woody debris of different diameter classes. FFMC fuels are present in virtually all fuel types, and represent the component of the fuel complex where fires start and spread. As such, the FFMC serves as a universal indicator of potential fire occurrence, particularly for human-caused fires (de Groot et al. 2005, Wotton 2009, Fig. 2). The DMC is used as a lightning fire predictor in northern forests where lightning ignitions can smoulder in the duff accumulated on the forest floor (Wotton and Martell 2004). DC is an indicator of potential for deep burning fires and difficulty of extinguishment. DMC and DC fuels are not found in the fuel complex of all fuel types, as this depends on vegetation litterfall and dead organic matter decomposition rates. Therefore, the FFMC has global application and the DMC and DC are only relevant in fuel types with significant organic soil development or dead woody debris fuel load. The FWI System also has three fire behaviour indices, which are general indicators of rate of fire spread (Initial Spread Index, ISI), fuel available for combustion within a moving flame front (Buildup Index, BUI), and head fire intensity (Fire Weather Index, FWI). The FWI component is also used as a general indicator of fire danger. The Daily Severity Rating, DSR) is a power function of the FWI that represents difficulty of fire control (Van Wagner, 1970). Figure 2. 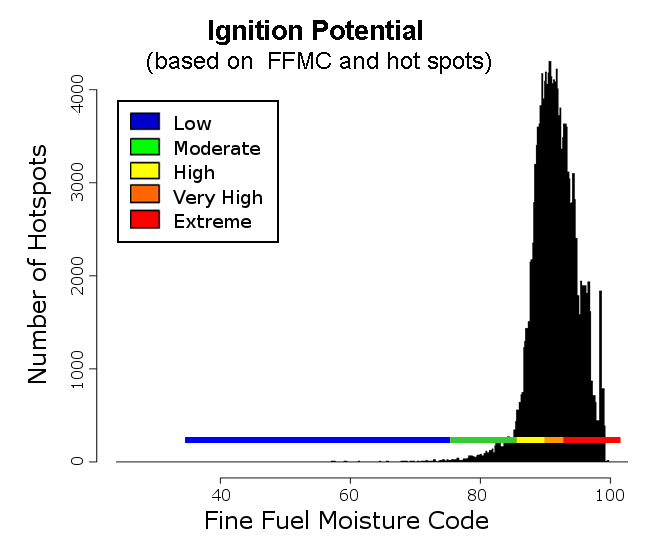 Calibrating the Fine Fuel Moisture Code (FFMC) with satellite-detected hot spots to construct a fire start predictor, or ‘Ignition Potential’ indicator. This example uses one year of MODIS hot spot data for sub-Saharan Africa and corresponding FFMC data for the hot spot location. Similar calibrations have been done for SE Asia and for Central and South America resulting in very similar FFMC scale calibrations. The Global EWS-Fire uses ground-based and remotely sensed data to prepare early warning products. Fire danger is calculated with Global Forecast System data from the U.S. National Centers for Environmental Prediction (NCEP) . The Global EWS currently provides 1-7 day forecasted FWI System data that are calibrated to commonly used threshold values that identify low to extreme conditions. By using a globally-consistent scale, the Global EWS provides a means of interpreting and comparing relative fire danger conditions across countries, continents, and biomes. All fire danger maps are supplemented with MODIS hot spot data for visual comparison with current fire activity. It is envisioned that Global EWS-Fire products will be tailored in the future to meet specific international information needs for agencies such as the UNISDR, Food and Agriculture Organization, World Health Organization, and the United Nations Environment Program. Global EWS-Fire products can be used to compare fire danger around the world because they use a globally-consistent calibration. As stated previously, this type of information is useful for making large-scale fire management decisions by understanding future fire danger trends across continents and over longer time periods. However, a single fire danger value has different meaning (in a fire management context) in different parts of the world because of differences in the local fire regime. For example, a Drought Code value of 500 may be interpreted as an extreme fire danger condition in northern boreal forests where there usually is frequent seasonal rainfall, but it may be considered a moderate or low value in drier biomes. For that reason, there is additional value in understanding fire danger in relation to the ‘local’ fire regime, which includes the influences of fuel, ignition sources, climate, fire management/suppression policy, etc. For that reason, the next stage in development of the Global EWS-Fire is regional calibration to adjust the fire danger scales using historical fire data (primarily remotely sensed) and weather data. This procedure will calibrate the Global EWS-Fire to provide operational-level information such as potential for fire starts and difficulty of control. Regional calibration will be a collaborative effort with regional and national agencies. There are a number of satellite data and modeling enhancements to the Global EWS-Fire that are being explored. Advances in measuring spatial precipitation from space likely offer the single largest improvement to the accuracy of fire danger maps and could reduce or eliminate the need for spatial interpolation of precipitation from ground-based point sources. Remotely sensed fuel mapping is also being pursued to develop a global fuel type map, which would be a first step towards developing global fire behavior prediction models. Monitoring of live fuel moisture (Ceccato et al. 2003) can contribute to establishing fuel flammability and seasonal criteria that are important to fire behaviour models and monitoring/modeling of fuel consumption, fire spread rate, and carbon emissions. The use of remotely sensed fire radiative energy to estimate fuel consumption and carbon emissions is currently being studied (Wooster 2002, Wooster et al. 2003). Fuel consumption could also potentially be combined with satellite-monitored daily fire spread data to calculate fire intensity. Ceccato, P., Leblon, B., Chuvieco, E., Flasse, S. and Carlson, J. 2003. Estimation of Live Fuel Moisture Content. In: Wildlife Fire Danger Estimation and Mapping. Chuvieco, E. (Ed.) World Scientific Publishing Co. p. 63-90. Deeming, J.E., Burgan, R.E., Cohen, J.D. 1977. The National Fire Danger Rating System – 1978 , USDA For. Serv., Intermt. For. Range Exp. Stn., Ogden, Utah, Gen. Tech. Rep. INT-39. de Groot, W.J., Wardati, Wang, Y. 2005. Calibrating the Fine Fuel Moisture Code for grass ignition potential in Sumatra, Indonesia . International Journal of Wildland Fire 14: 161-168. FAO. 2006 . Fire management review: international cooperation. 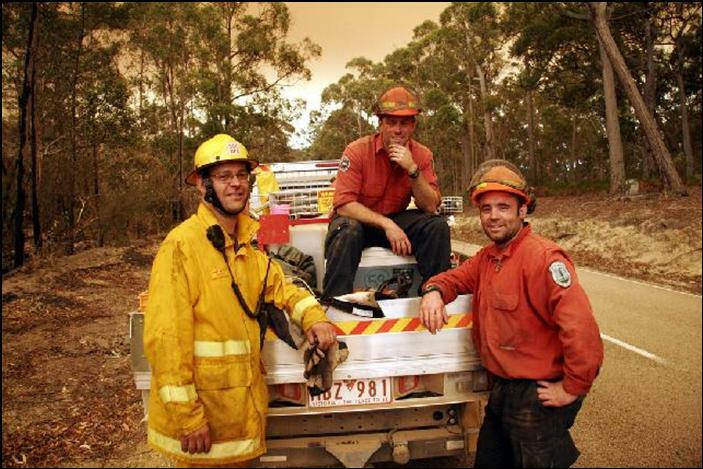 Fire Management Working Paper 18. Food and Agriculture Organization, United Nations. Rome. FAO. 2007 . Fire management – global assessment 2006 . Food and Agriculture Organization of the United Nations, Rome. pp. 135. Giglio, L., Randerson, J.T., Van der Werf, G.R., Kasibhatla, P.S., Collatz, G.J., Morton, D.C., DeFries, R.S. 2010. Assessing variability and long-term trends in burned area by merging multiple satellite fire products. Biogeosciences 7, 1171-1186. IWFC (2007) Conference Statement , IVth International Wildland Fire Conference, 14-17 May 2007, Seville, Spain. Luke, R.H., McArthur, A.G., 1978. Bushfires in Australia. Canberra, CSIRO Div. For. Res., Australian Gov. Publ. Serv. Mouillot, F., Field, C.B. 2005. Fire history and the global carbon budget: a 1°x1° fire history reconstruction for the 20th century. Global Change Biology 11, 398-420. Van Wagner, C.E. 1970. Conversion of Williams severity rating for use with the fire weather index. In. Can. Dep. Fisheries and For., Petawawa Forest Expt. Stn., Petawawa, Ontario. Van Wagner, C.E. 1987. Development and structure of the Canadian forest fire weather index system. In. Canadian Forest Service, Ottawa, Canada. Wooster, M.J. 2002. Small scale experimental testing of fire radiative energy for quantifying mass combusted in natural vegetation fires. Geophysical Research Letters 29(21) 2027, doi:10.1029/2002GL015487. Wooster, M.J., Zhukov, B., Oertel, D. 2003. Fire radiative energy for quantitative study of biomass burning: Derivation from the BIRD experimental satellite and comparison to MODIS fire products. Remote Sensing of the Environment 86: 83-107. Wotton, B., 2009. Interpreting and using outputs from the Canadian Forest Fire Danger Rating System in research applications. Environmental and Ecological Statistics 16, 107-131. Wotton, B.M., Martell, D.L., 2005. A lightning fire occurrence model for Ontario. Canadian Journal of Forest Research 35, 1389-1401.